As Elizabeth Warren’s campaign developed its organizing strategy this winter, it spent big to bring on a whopping 161 staffers — nearly twice as many as her closest rival in the Democratic presidential primary. The early hiring spree, which cost Warren’s campaign nearly $1.2 million in salary plus more on related expenses, amounts to a big bet on what it will take to win the 2020 presidential race. The buildup had Warren spending money almost as fast as she raised it at a time of year when presidential campaigns traditionally hoard their cash, according to new campaign finance filings. But the decision sheds new light on the priorities and strategy behind Warren’s campaign, which believes organization in the early-voting states could make the difference next year. And it wasn’t just Warren placing a wager. Kamala Harris’ shock-and-awe first week in the race culminated with a big gamble: a highly produced rally in Oakland that cost the campaign more than a half-million dollars — but drew 22,000 people and saturation media coverage, providing an early jolt for her standing. Nearly every campaign spent big on digital advertising in recent months, bidding for online donor support that may not take off for months. “The risk is you build it and they don’t come,” said Steve Elmendorf, a Democratic strategist and presidential campaign veteran. He doubts all 19 Democratic campaigns will be around later this year. The financial reports from the race’s first three months offer the first detailed, behind-the-scenes look into the campaigns’ earliest priorities. Roughly half of Warren’s 161 staffers are working in the early states — a huge on-the-ground investment at a time when her campaign has yet to take off. 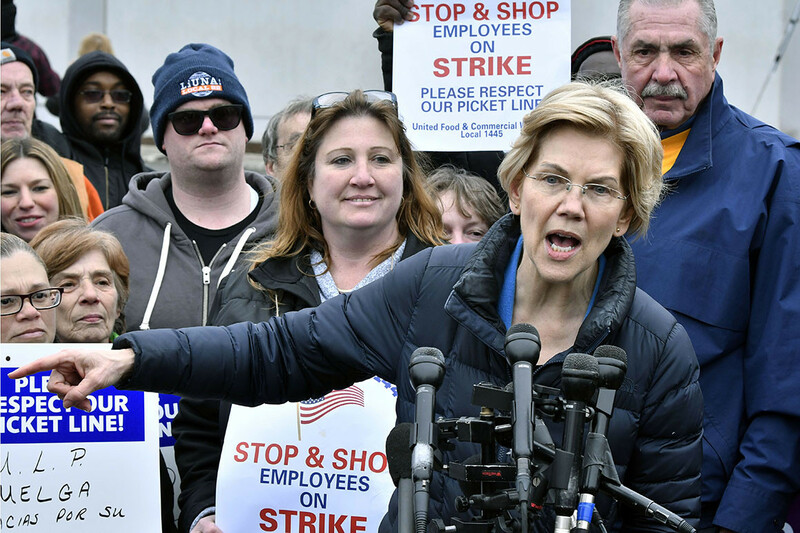 Warren’s employee overhead far eclipsed that of Bernie Sanders, who paid 86 staffers; Cory Booker, who hired 62; and Harris, who had a staff of 44 by the end of March. The decisions come with trade-offs: Harris was able to hold on to more of the $12 million she raised. Yet she’ll have to build out her staff after other campaigns have hired — in an exceedingly crowded field that will grow even larger. Warren’s spending — her outlays depleted more than 85 percent of the $6 million she raised after swearing off traditional fundraisers — means she’s relying on the safety net of the $10.4 million in reserves transferred from her Senate committee. But the large team is central to Warren’s organizing strategy. She announced her exploratory committee earlier than most other candidates and immediately began scooping up experienced field staff, many of whom were also recruited aggressively by rival campaigns. There’s precedent for having such a large team so early in a presidential contest: In the first quarter of 2007, Barack Obama’s field-focused campaign paid 191 staffers, while Hillary Clinton’s paid 85. Such a large staff also requires a regular cash flow. In the first quarter of 2007, Obama raised $25 million. Warren’s ability to raise money may be more restrained given that she has forsworn big-dollar fundraisers. But the campaign can go back to most of its 135,000 donors from the first quarter for more money; fewer than 150 people have given Warren the maximum allowed donation. The campaign has also been trying to use its small-donor approach rolled out in February to distinguish itself from others and jump-start more small-dollar donors. “One of the other candidates who had more or less the same number of donations raised 55% more money because of big-dollar contributions. Another candidate had just about the same number of people donate overall, but also raised twice as much money from big-dollar donors,” campaign manager Roger Lau told supporters in an email last week, in a jab likely meant for Harris, who raised $12 million from 138,000 donors. Harris transferred in another $1.2 million to her campaign. She finished the quarter with $9 million. Harris’ splashy launch, which shut down a plaza in her hometown of Oakland and was carried live in its entirety on all three cable networks, was made before she emerged as one of the race’s top early fundraisers, bringing in a mix of small and large-dollar donations. It paid off. Her favorability with voters shot up by double-digits and generated a buzz that continues to follow her. Harris has drawn crowds of thousands to her routine town hall events in the early states and Texas. The Oakland rally was also a one-time expense and won’t require repeated feeding. In all, Harris spent more than $475,000 on staff, while Sanders paid about $415,000. Others who raised less risk trouble, as early campaign “burn rates” grow given the high cost of staff and increasing importance of digital ads. The Senate transfers helped paper over some of the less impressive performances. Kirsten Gillibrand transferred $9.6 million —76 percent of the total money she brought in. Digital ad spending continued to grow in importance, as top candidates work to build the networks that will help sustain their campaigns in later months. Lesser-known candidates struggling for cash, meantime, pressed supporters for small contributions to help them meet the Democratic Party’s threshold for the June and July debate stages. Sanders dropped about $1.5 million on digital ads, while former Rep. Beto O’Rourke spent $1.3 million on his digital advertising blitz — which accounted for half his total campaign spending, given his recent entry into the race. Harris, who has worked in recent years to improve her digital standing, spent $1 million. “It’s remarkable: Digital advertising is the largest line item outside of staff for most of, if not all, the 2020 candidates,” said Tim Lim, a Democratic digital strategist who is a partner at NEWCO Strategies and founder of Blue Digital Exchange.